The moon is the brightest object in the night sky -- a natural night-light. People once believed that water on it's surface made it shine. Now we know that the moon's glow is reflected sunlight. A full moon may make you think of howling wolves. But wolves don't really howl at the moon. They just hunt more actively on night that are clearly lit. Why does the moon appear to change it's shape every few days? it's circling Earth, and as it moves, it reflects sunlight, creating the shapes (or phases) that we see. At first the moon is not visible (a new moon). Then it "grows" (or waxes). After the full moon, it "shrinks" (wanes). 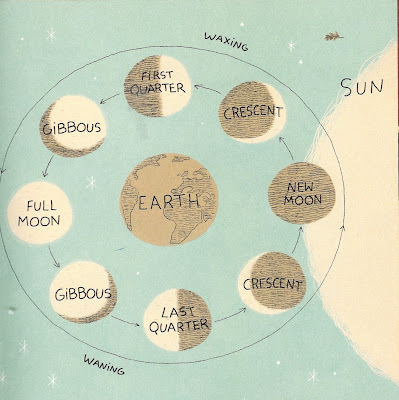 Tonight, see what phase the moon is in. Q: What should you say to a blue moon? A: put on a happy phase. Q: How come the moon always looks so shiny? A: because every few weeks there's a new one. Q: Why was there a waiting list for astronauts to land on the moon?